The left pillar of the Tree is that of Severity, also called Justice. It contains the tree's negative, passive, receptive, or feminine aspects. 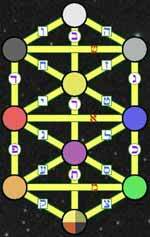 In it are the three Sephiroth Binah בינה, Geburah גבורה, and Hod הוד. Binah is the possibility of boundaries. Geburah is the response to boundaries. Hod is the appreciation of boundaries. These act to restrain the creativity of their counterpart Sephiroth in the pillar of Mercy.